What Would You Do With A GT500KR? You already knew one of us was out here in sunny Southern California after our little photographic fun with all three new American muscle cars in one photo for the very first time. But that wasn't the only reason we were out here on America's Left Coast. The other reason? 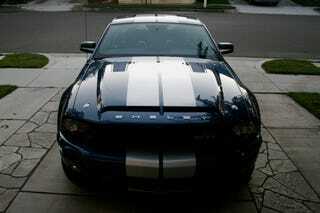 The 2008 Shelby GT500KR. We've been given the keys to the only super 'Stang in Ford's media fleet to drive longer than any other car outlet's gone in the car to date. We'll be taking this 580 HP über-muscle car on a 1,779 mile trip from LA to Dallas. Along the way we'll stop in Las Vegas and Phoenix, liveblogging the entire way. Follow along with us at our Shelby GT500KR Road Trip tag. Although this now begs today's question of the day, what would you do and where would you go with the GT500KR and a full tank of gas?